This is an outfit I wore out to get some pizza with the family which means it's cozy and washable! Mid rise jeans with stretch are a MUST for pizza night. 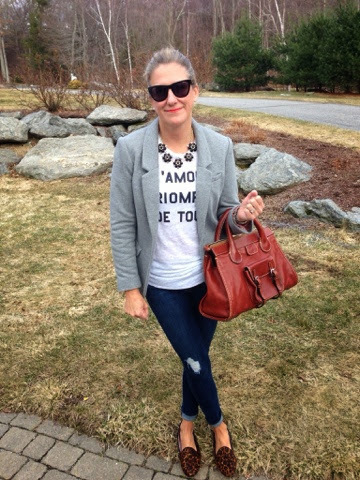 The graphic tee and the statement necklace and the leopard loafers might have been a bit too much for pizza night...but I kind of love it? Also, if you are looking for a pair of sunglasses, I highly recommend Westward Leaning. I have been searching high and low for wayfarers that look OK on me. These have a very slight cat eye which I think works on almost everyone. Most of my glasses are super cheap since little ones seem to always destroy them. Now that my son is getting older and knows he shouldn't grab them directly off my face, I was ready to get one investment pair. They are definitely pricey, but I sold some things on E-bay to keep them in budget. They are Olivia Palermo's go to glasses and are under $200.00. Want to see them on some other people....check out their celebrity look book page. In addition they donate $10 of each pair to charity. I am really impressed with the comfort and quality and even wore them skiing all day too. And aren't we glad it's sunglass season!